Torsten Nilsson, at the Swedish Museum of Work is starting work on an EU project to record near extinct sounds. What sounds would you suggest that Torsten should record: An old typewriter? A dial up modem? A steam train? 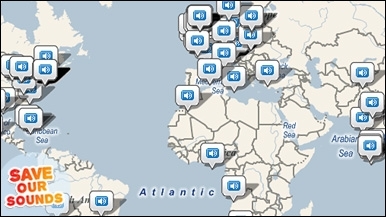 Soundmap from the BBC’s Save Our Sounds project that I worked on. including Beijing, Berlin, and Chicago. Peter has been running the Favourite Sound Project for over a decade, so some of the original sounds have disappeared. When trains used to arrive in London, there was a staccato cascade of door slams as passengers disembarked. This sound disappeared as the old rolling stock was decommissioned. Fortunately for Torston, he can just ask Peter for a copy of his CD of London’s favourite sounds to get a recording. When Peter carried out the project in my home city of Manchester, the hoot of the Metrolink tram was popular. The trams had recently been reintroduced into the city and were seen as a sign of renewal and regeneration. Peter often finds the sounds people cite are about everyday life rather than being particular soundmarks. Respondents might talk about the sound of frying bacon, the roar of the crowd at Manchester United, or the announcement on the train as they approach their home stop. These sounds are favourites because they remind people of good times: eating, watching your favourite team, or getting home at the end of the day. If you were going to choose a sound for Torsten, to preserve what would it be and why?